Snow Removal Safety Tips | 41 Lumber - Serving Iron Mountain and the U.P. For those who live in the colder climates, snow removal comes with the territory. Unlike mowing the lawn, it’s not the type of job that you can simply get to when it’s most convenient. Often, snow removal is needed at the most un-opportune of times. Usually, it’s when you need to be going to work or get the kids off to school, that this chore suddenly presents itself. But the fact is, no matter how much of a hurry you are in, it’s not a job that should be rushed. Whether you’re using a snow plow, a snow blower, or just a shovel, there are plenty of opportunities for injury. If using a shovel, try to keep the work in manageable amounts. Begin shoveling before the accumulation gets too high. For example, it’s better to shovel 3 inches of snow 3 times, rather than 9 inches of snow once. When shoveling, remember to bend your knees and try to avoid excessive twisting of your back. Make sure to wear slip resistant boots and dress accordingly for the conditions. It’s much easier on your back to push the snow, rather than lift it. Keep aware of your body. If you find yourself getting short of breath, begin sweating, or experience chest pain, then stop immediately. Though you should bundle up, do not restrict your vision with a hat or scarf. It’s important to have a good idea of your surroundings and keep a solid footing to prevent slipping and falling. Try to use a snow blower for the heaviest stuff. Make sure that your snowblower is in tiptop running shape before the snow falls. 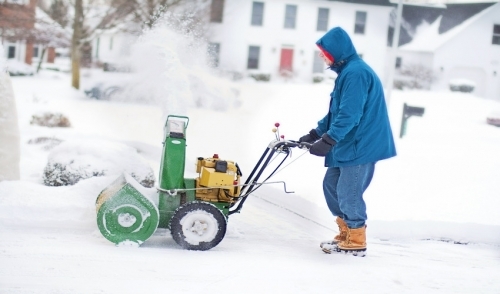 Make sure you are aware of all of the snowblower’s features before you begin operation. Keep hands and feet away from all moving parts of the snowblower. Leave all of the safety features in place. Make sure that you turn off the snow blower when unclogging the blades. Allow it to set for a few seconds, to make sure the impeller blade has stop spinning, before attempting to unclog it. Never use your hand to unclog the snowblower. Be as alert as possible. Keep aware of your surroundings, especially towards the end of the driveway. Keep an eye out for passing cars and snowplows.